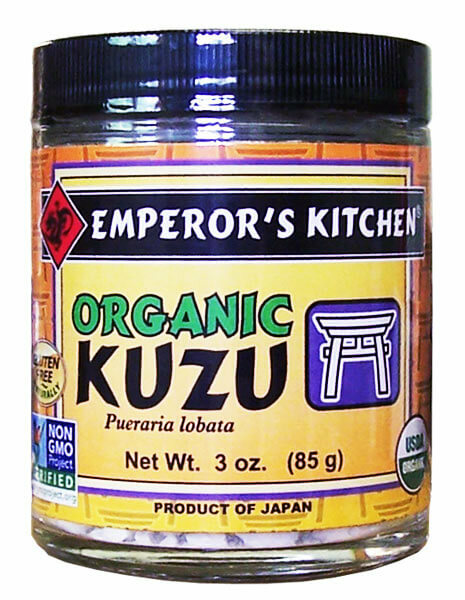 Emperor’s Kitchen Organic Kuzu is USDA certified organic and Non-GMO verified. The craft of processing kuzu powder came to Japan, like so much else in Japanese culture, from China, but underwent further refinement over time. It is the traditional staple thickening agent in Japanese cuisine. Kuzu is traditionally used as a simple home remedy for digestive tract irritations. In many instances of abdominal aches and intestinal irritation, a cup of simple kuzu cream (kuzu with umeboshi paste, shoyu, and fresh ginger juice) brings quick relief, particularly with children, who often do not like the taste of over-the-counter medications. Kuzu cream is also very useful against colds, stomach cramps, diarrhea, neutralizing stomach acidity, and relaxing tight muscles. Kuzu also contains a very high concentration of flavonoids, powerful natural antioxidants, which contribute to this plant’s strong medicinal effect on digestive and circulatory ailments. Flavonoids also inhibit the contraction of smooth muscle tissue, thereby increasing blood flow and relieving cramping in the intestines. INGREDIENTS: Organic dried kuzu root.